Pork tenderloin is on regular rotation at my house, both for its flavor and its ease. We love to marinate it in sweet and savory teriyaki sauce, or serve it with a big dollop of Spanish-style romesco. 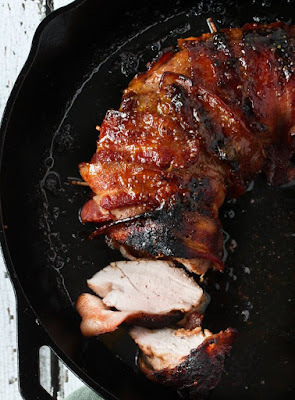 But our current favorite is definitely wrapping that pork tenderloin in bacon, because as my neighbor says, pork on pork can never be a bad thing. And I must say I agree. Arrange a rack in the middle of the oven and heat to 350°F. Using a sharp knife, remove the silverskin (the silvery-white connective tissue running along the top) from the pork tenderloin. Pat the tenderloin dry with paper towels and set aside. Heat the oil in a large cast iron skillet, or other oven-proof skillet, over medium-high heat until shimmering. Add the bacon-wrapped tenderloin and sear undisturbed until deep caramel brown, 6 to 8 minutes. Flip the tenderloin and sear until the other side is browned. Mix the chutney and mustard in a small bowl and brush generously over the top of the tenderloin. Transfer the skillet to the oven and cook the tenderloin until the center registers 140°F, 10 to 14 minutes. Remove from the oven, loosely tent with aluminum foil, and set aside to rest for 10 to 15 minutes to allow the tenderloin to finish cooking and for the juices to redistribute into the meat. Remove the toothpicks and cut crosswise into 1/4- to 1/2-inch thick slices. Serve with any leftover chutney on the side. Chutney: You can find Major Grey's Chutney at most grocery stores, or purchase it online. You can also substitute another favorite chutney or jam. 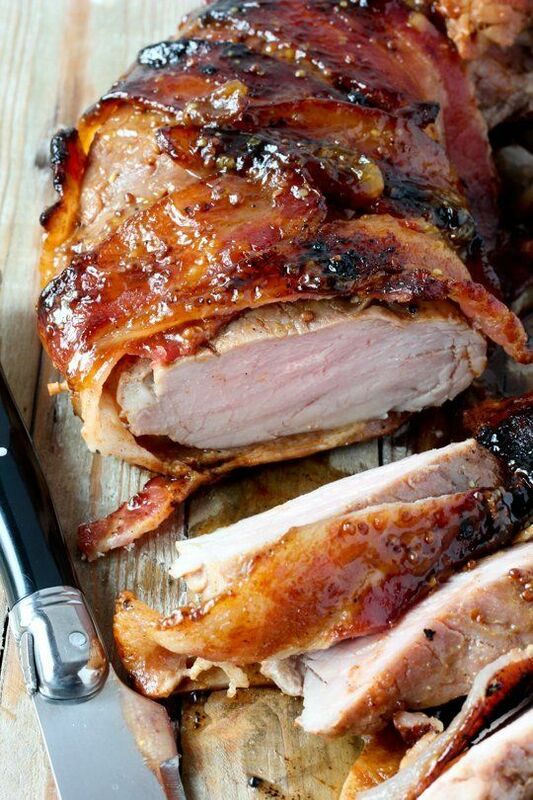 0 Response to "Bacon-Brown Sugar Pork Tenderloin"